Select a safe place such as a basement, storm cellar, or interior room in your home with no windows to stay during the storm. If a tornado is in the area, take shelter there until the storm has passed. Tornadoes can last a few seconds or more than an hour, but typically don’t last more than 10 minutes. Prepare an emergency kit filled with essential items family members and pets may need. The kit can include food, bottled water, flashlights, battery-powered radio, extra batteries, medications, blankets, and extra clothes. If small children are present, pack books or puzzles to keep them occupied. Plan where family members will meet if separated during the storm. Choose a family member or friend who lives in another state for everyone to contact if separated. 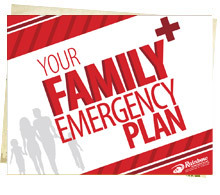 Learn the emergency action plan at work, school, or other places frequently visited. Always know what to do in case a tornado is in the area. Schedule tornado drills in the home to make sure all family members know what to do in case of emergency. If a tornado is in the area, listen to weather warnings. A tornado watch is when the weather conditions are susceptible to a tornado. A tornado warning is when a tornado has been sighted in the area. Pay attention to the community warning system in place. Take all signals seriously and instruct family members to do the same. Be aware of the warning signs of a tornado such as dark, greenish colored clouds; clouds that have debris; large hail; funnel cloud; and a loud roar or rumble. After a tornado passes: 1) Wait for emergency teams to arrive. 2) Offer help to those who may be injured. 3) Avoid contact with power lines and puddles with wires in them. 4) Watch out for broken glass, nails, and other sharp objects on the ground. 5) Never use matches or a lighter, in case of leaking natural gas pipes or fuel tanks. For information on preparing for and dealing with a tornado and its aftermath in your area, contact your local Rainbow International or visit RainbowIntl.com.